Combining heart-soaring contemporary romance with heart-pounding suspense is a trademark of New York Times and USA Today bestselling author Lori Ryan—and in her novel Ever Hopeful she delivers spectacularly on both counts. Two-months pregnant and trapped in a violent marriage, Laura Kensington realizes that her ruthless and powerful in-laws will never let her go, even after the strange sudden death of her abusive husband. Fleeing far away to the Texas ranch of Cade Bishop, a strong yet tender man who believes in second chances, Laura finds herself irresistibly drawn to Cade’s gentle passion and giving heart. But there is no escaping the shadows of her past and soon danger re-enters her world, pulling Laura into a deadly web of lies, betrayals, and murder. And only Cade Bishop’s quiet strength and unwavering love can set her free. Laura watched the clock on the microwave and willed the phone to ring. Patrick would be home within the hour. If “John Smith” didn’t call soon, she’d… Well, she didn’t know what she’d do. If he called after six o’clock, she’d have to try to convince Patrick it was a wrong number. He wouldn’t fall for that. Even genuine wrong numbers had gotten her into trouble before. The numbers on the microwave stared back at her, blank and unfeeling. Twelve minutes past five. The clock apparently didn’t care that time was running out, that she was cutting this much too close. Forty-eight minutes left. Laura’s heart felt like it would jump out of her chest as she cradled her head in her hands. The phone rang causing Laura to jump a foot in the air at the sound. How was it that a sound she was waiting for—hoping for—sent her into a panic? “Hello,” she said breathlessly into the phone. “Mrs. Kensington?” came Smith’s voice on the other end. She had talked to him before, but hadn’t met with him in person. He sounded kind, even though she knew he was a man who spent a lot of time with unsavory people. But, that was to be expected given his profession. Despite that, she’d been told he often worked with women who needed to leave a spouse and who wished not to be found again. Maybe there was an empathetic side to him. “Can you talk now?” he asked and she knew right away what he meant. He had never asked why she was leaving and she certainly hadn’t volunteered the information, but it seemed as if he knew without having to ask. Just the thought that he knew her secret made her uncomfortable. “Did you get the first package?” he asked. He had mailed it to a post office box she’d set up two towns over from her and Patrick’s home in Windsor, Connecticut. “How much time?” Laura asked, wanting the answer to be days, not weeks or months, but she knew that was unlikely. “Not for another few weeks. It takes time to get a real birth certificate and once that’s in place, it takes a little longer for your social security number to come through,” he said with the tone of a man who had explained this to her all before. He had. She was partly just nervous and partly hoping for a different answer this time. This just had to work. There wasn’t any other option. Before Laura could answer, he continued with instructions. “Save this phone number. I’ll need you to call me in three weeks and let me know where you are. I’ll need a mailing address.” There was no talk of payment. She’d already paid in full just to get him started on the new identity for her. He also didn’t ask her when she was leaving and she didn’t tell him. He seemed to assume she wouldn’t be in town in three weeks’ time and he was right. Laura would be running next week, as soon as Patrick left on his business trip. The sound of car tires crunching up the drive sent panic churning through Laura’s stomach. So much so that she thought she’d be sick, but that wasn’t unusual nowadays. She was nauseated for several hours every day and often had to run to the bathroom to be sick. “I have to go,” Laura whispered and didn’t wait for a response. She tucked the phone in her pocket and turned to the stove, focusing on making her breathing normal, making sure nothing seemed out of place. Lori is an award winning author and stay-at-home mom. Her second book, Penalty Clause, won first place in the romance category in Lcuky Cinda Publishing’s Annual Global Writer’s Contest in 2013. Lori has had a number of careers before embarking on her newest adventure of writing novels. After graduating from the University of Connecticut School of Law, she practiced law for three years, working primarily in the areas of utilities law and intellectual property litigation. Lori still lives in Austin with her husband -- who is endlessly supportive of her changing career paths -- and her two children, one cat, and three dogs. How can your readers follow you? To join my email list to receive updates and news, including sneak peeks and free giveaways or contest news, visit http://www.loriryanromance.com/#!join-my-mailing-list/cdpp. To buy my books, visit my author page on Amazon: http://www.amazon.com/author/loriryan. 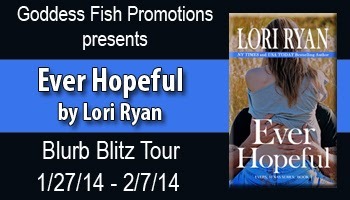 Ever Hopeful will be priced at 99 cents for the first two weeks! After reading the excerpt I am totally interested in reading this book! Thank you for the giveaway!! Wow, This book looks amazing!!! Sounds a bit disturbing but definitely interesting. Thanks for the giveaway. Lovely excerpt, thanks for sharing! The except sounds really interesting. Thanks for sharing.